So about thirty years after I initially learned about it, this past weekend I finally played my very first game of Clue. 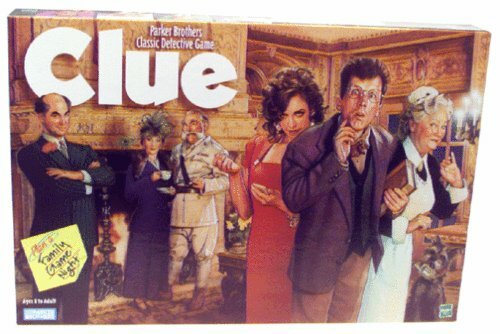 Up 'til now, my only real exposure to the Clue franchise was the 1985 film, which had three different endings. I got introduced to that back in college, by roomie/now filmmaking partner "Weird" Ed Woody. I told him then that Clue was always a game that I'd wanted to try but never had the chance. That finally came on Sunday afternoon. It was raining hard in Norfolk (while everyone back home was getting snowed hard upon) and instead of going out, the four of us opted to stay in and watch movies, play games and such. And so it was that Clue was brought out. I didn't know anything about the actual rules, but I quickly was brought up to speed. For my piece I chose Mrs. Peacock, only because she was already on the side of the board that I was sitting on. And I didn't win. That honor belonged to our friend Grace. But I had a heck of a fun time! Lord willing we have some children ('cuz Clue needs 3-6 players) I'm definitely gonna invest in a copy of this game. Wow, talk about a blast from the past, it has been 20 some years since I played that.